First Lieutenant, James E. Berry; 2nd Lieutenant, Wm. Carter Williams; 3rd Lieutenant, Thaddeus E. Eisenbiess. The company took its name from the old United Fire Company, of, which most of its men were members. A long habit of contending with the flames had inured them to dangers. Upon being mustered into service the company was stationed at Fort Norfolk and was furnished with muskets, and also was placed in charge of four light guns and drilled both as infantry and artillery. They also had charge of a battery of heavy guns, so that, during the year the company was at Fort Norfolk, the men became experts in all branches of the service except the cavalry. In July, 1861, Lieutenant Williams was elected Captain of a company from Princess Anne county, which was attached to the 6th Regiment as Company B. Lieutenant Eisenbiess was promoted to 2d Lieutenant and Edward Lakin was elected 3d Lieutenant. Upon the organization of the 41st Virginia Regiment of infantry the United Artillery Company was attached to it as Company E.
In April 1861, Confederate troops seized control of the naval facilities in and around Norfolk. 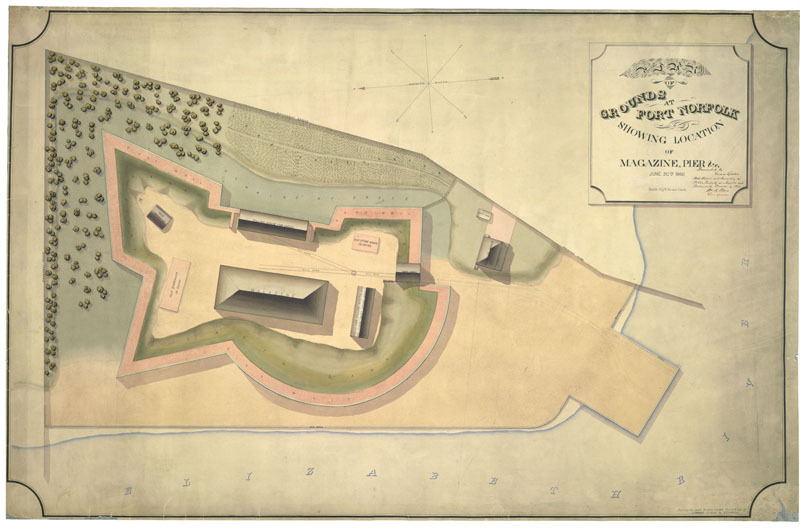 At Fort Norfolk, Confederate troops erected a battery of six large guns en barbette and also manned several smaller pieces in other parts of the fort (Clary 1990:99; RAGO, "Citations and references to Fort Norfolk"). Confiscated ammunition from the powder magazine was used by the ironclad CSS Virginia during its March 1862 encounter with the USS Monitor in Hampton Roads (Melchor 1986:21). Confederate troops were housed at Fort Norfolk and at the adjacent Randall & Brown warehouse. When the Confederates evacuated Norfolk, Augustine Morrell found that the second floor of his warehouse, which had been occupied by the Confederates, was a "mass of varied filth." A portion of the first floor bad been used as a stable and was "littered with an accumulation of manure" (OQMG Claims Commission brief, May 29, 1867). The buildings at Fort Norfolk may have been similarly used.